Leading architecture and design magazine Dezeen has announced the winner of its unofficial Brexit passport design competition. 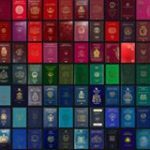 The jury selected a design that represents the country’s transition away from the EU, with the cover depicting the signature dark blue of the UK’s pre-EU passport seeping onto and over the EU’s burgundy. The transition between dark blue and burgundy can be interpreted in several ways, which, the jury says, represents the various Brexit sentiments of all British citizens. In second place is a passport design that speaks to creating relationships abroad. The design, which the bearer can wear thanks to a lanyard around the neck, includes computer-generated phrases in different languages based on the bearer’s biometric data. The idea behind the runner up entry was to create a passport that could act as a conversation starter. See all entries for the competition at Dezeen.